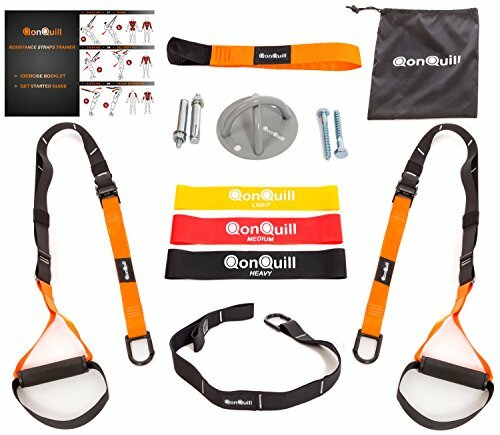 ⁫⁫QONQUILL RESISTANCE STRAPS TRAINER ➤ START BUILDING YOUR DREAM BODY IN YOUR COMFORT ZONE! ✔ COMPLETE BODYWEIGHT TRAINING KIT: We always like to offer MORE. So right now, besides the Basic Resistance Straps Trainer Kit that includes: 2 x Resistance Straps, 1 x Door Anchor, 1 x Extender Strap, 1 x Drawstring Bag, 1 x Exercise Book & Get Started Guide, we ALSO offer you a strong & durable WALL MOUNT BRACKET ceiling anchor (Sold at $ 14.84) + 3 RESISTANCE LOOP BANDS (Sold at $ 12.87). The offer is limited. If you have any questions about this product by QonQuill - Sport & Fitness Equipment, contact us by completing and submitting the form below. If you are looking for a specif part number, please include it with your message.